A new challenger has appeared. 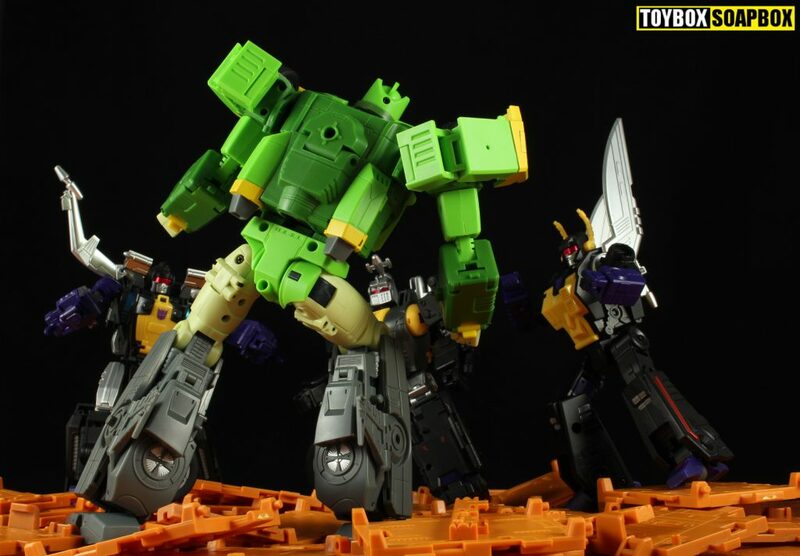 The third party Masterpiece market is getting really crowded at the minute so anyone hoping to make inroads is going to have to do something special to get a foot hold. Lowering the price to half of what your competitors charge is a pretty easy way to do that and it’s exactly why we are talking about Open and Play’s Big Spring today. 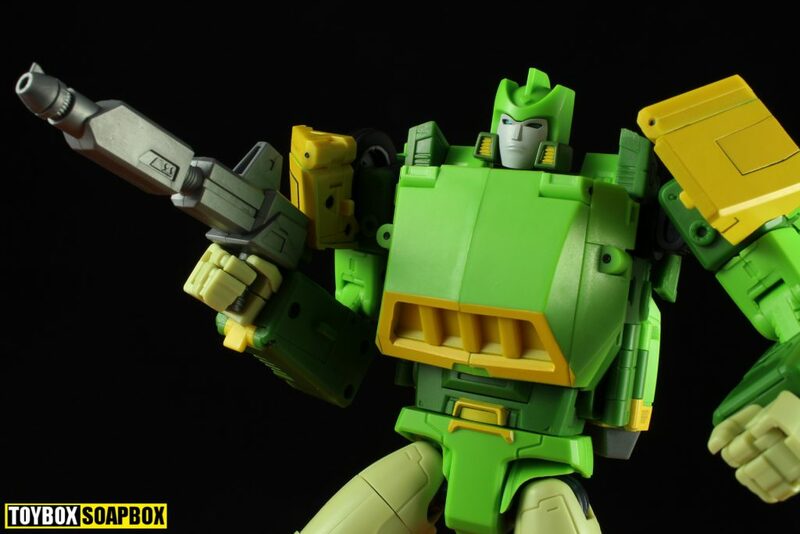 On top of being an amusingly named crack at a Masterpiece style Springer figure, this toy comes with a specific ethos that reflects the name of the company. Sound intriguing? Carry on reading to find out what that’s all about…. 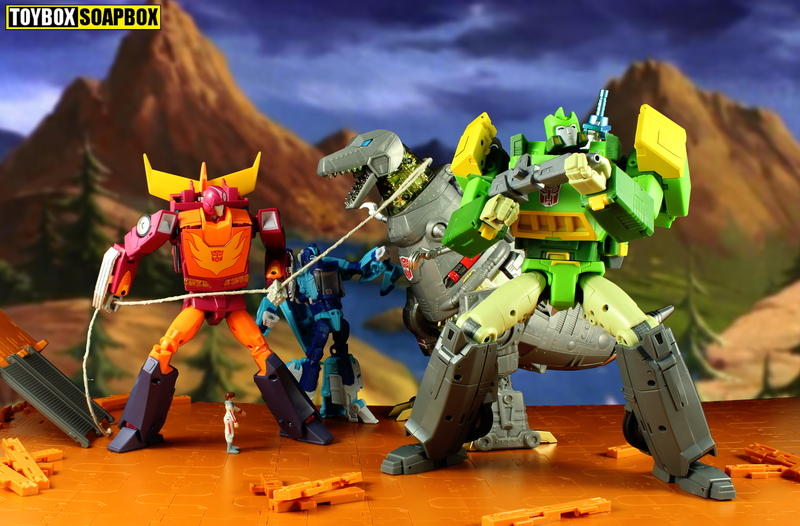 Springer being a triple changer means we get three modes to talk about. 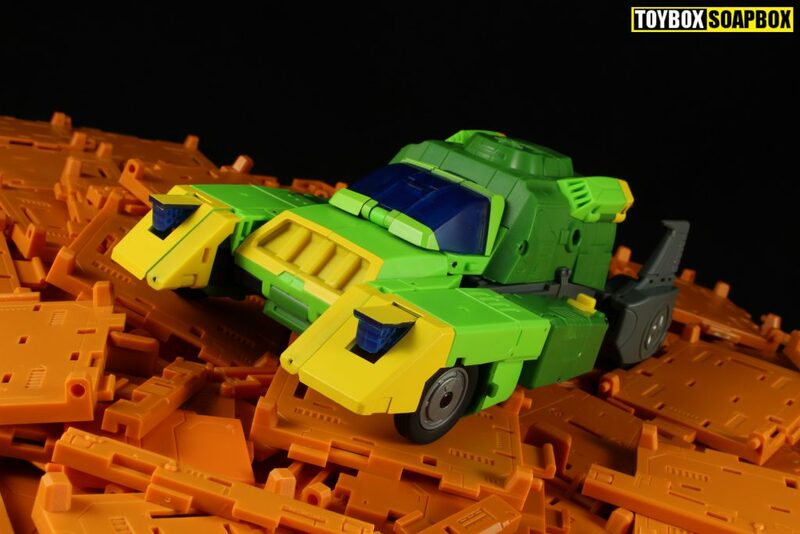 When you look at the picture above you might dispute that it’s proper alt mode, but yes that is a recreation of Springer’s Floro Dery conjured futuristic armoured car vehicle mode. I assume it just fell out of his mind, many of his designs were pretty on the edge but it’s still a pretty cool thing. I’ve always kind of enamoured by the idea’s of cars with cockpits rather than a bog standard windscreen. Perhaps that’s why I’ve yet to learn to drive. Is it an armoured car? I only call it one because it looks like a right chunk of something on wheels, coming outfitted in grey and dark green that is usually suggestive of military. Rocket boosters sit on the top and the slanted portions at the front create an idea that Springer is designed to be able to ram straight through anything that tries to get into his path. Be that a Decepticon or a Greggs delivery truck. No weapons are sculpted in or pop out of any part of the vehicles considerable frame. For something that feels like it’s meant to do battle the lack of artillery seems slightly off. You can peg the gun on the side or into the roof if you really need him to have a weapon but it’s sad kind of compromise. Open & Play have furnished him with blue head lamps that flip-up from the yellow sections on either side. He can light someones darkest hour or dazzle drivers on the A453 with his high beams. Everything comes together in a heavy, compact form that Kevin McAllister would happily lob through a toy store window in order to stop the Sticky Bandits. No part of it feels loose or fragile as every part clicks and clunks tightly into place. You could whirl it around like a nunchuck and nothing would unplug. Nothing hangs loose enough for you to whirl it like a nunchuk…so you absolutely couldn’t do that. Each bit tightly locks in with only two exceptions – the wind shield and the green panels on the rear of the vehicles. The windscreen leaves a gap between itself and the bonnet due to tolerances.You can push it down but mine pushes back up. If I was not busy drinking beer I could probably fix it, but Brooklyn’s Summer Ale is only available for a limited time…so priorities. The back end is still just sort of there and could maybe have stood to have been stretched out a bit, but so many of these companies pick frames from the cartoon and the animated that this is probably accurate to something somewhere. And we all know not being accurate invokes the internet Eye of Sauron. Transforming Big Spring between alt modes is spiritually similar to the vintage Springer toy. The rear folds back into a tail and the sides slide backwards, split in half and wrap around. The whole thing is simple but it’s refreshing to not be put off moving a Masterpiece scale triple changer between modes by fiddly, complex, fragile bits. Some little flourishes add a bit more to it such as fins that automatically pop out from the tail, the little yellow fins that emerge from inside the forearms and Open and Play’s most unique contribution – a shrinking windscreen. 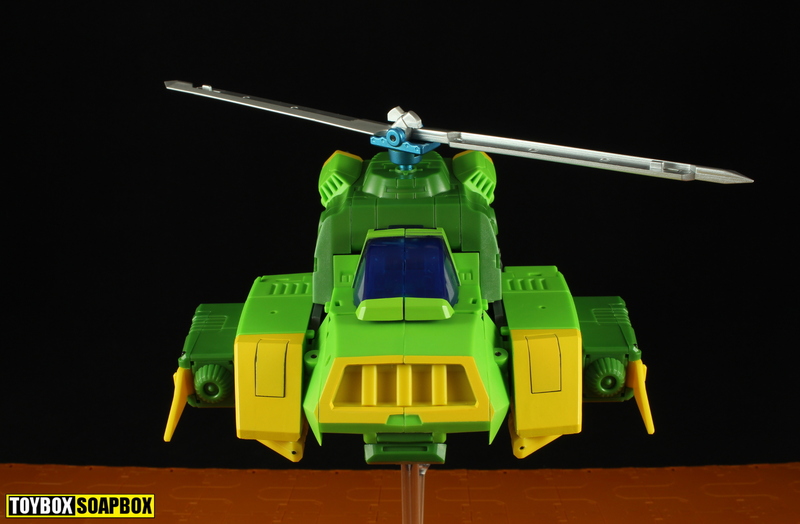 Of all the MP style Springer toys available, or on the horizon, Open and Play’ Big Spring has got the best helicopter mode in my opinion. 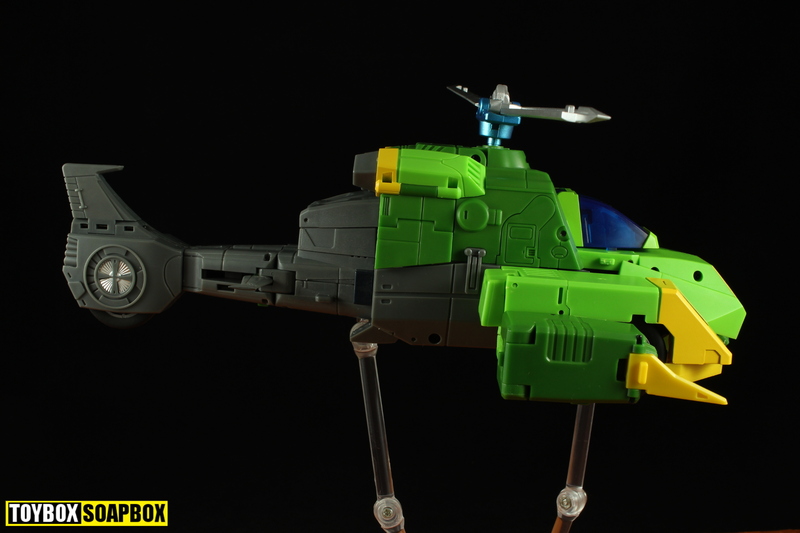 Helicopter form is the alt mode that works best for Springer because it is always a more clearly defined body shape. You have the long tail with the fins, the large front pontoons and large rotor blades. 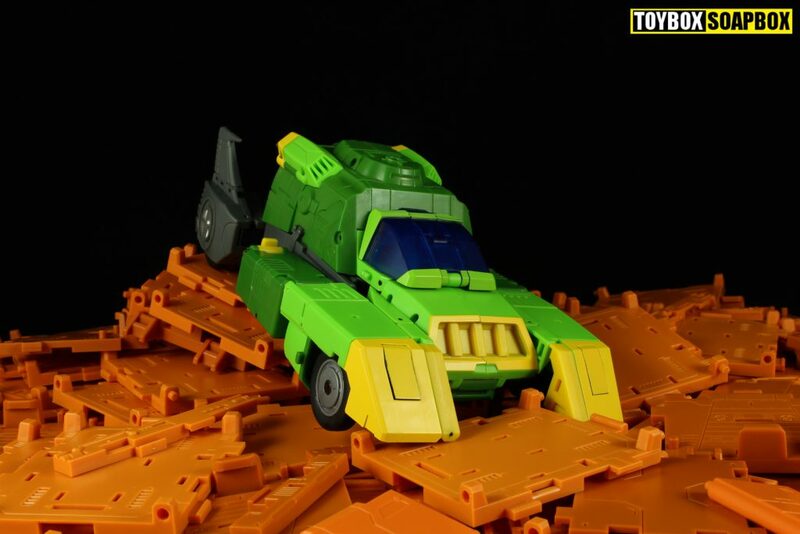 It’s not anything real but it looks like it could be, whereas the car mode hasn’t decided what it wants to be when it grows up. The gun can still attach to the sides, the lights can still pop and because it’s effectively the car mode stretched out it can even roll just as well on the rubber tyres. I spent ages doing that because it made be giggle. 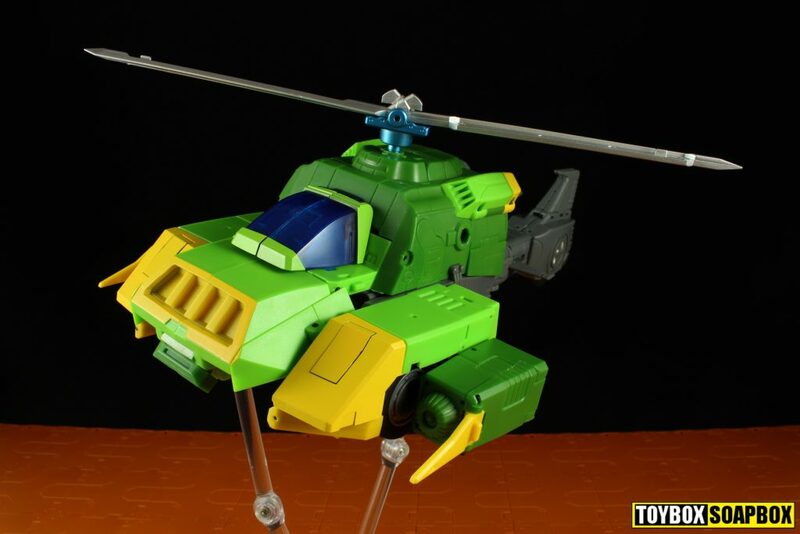 “The ultimate combination of car and helicopter, it’s… helicarpter!”. That was terrible even by my low, Danny Dichio-esque standards. 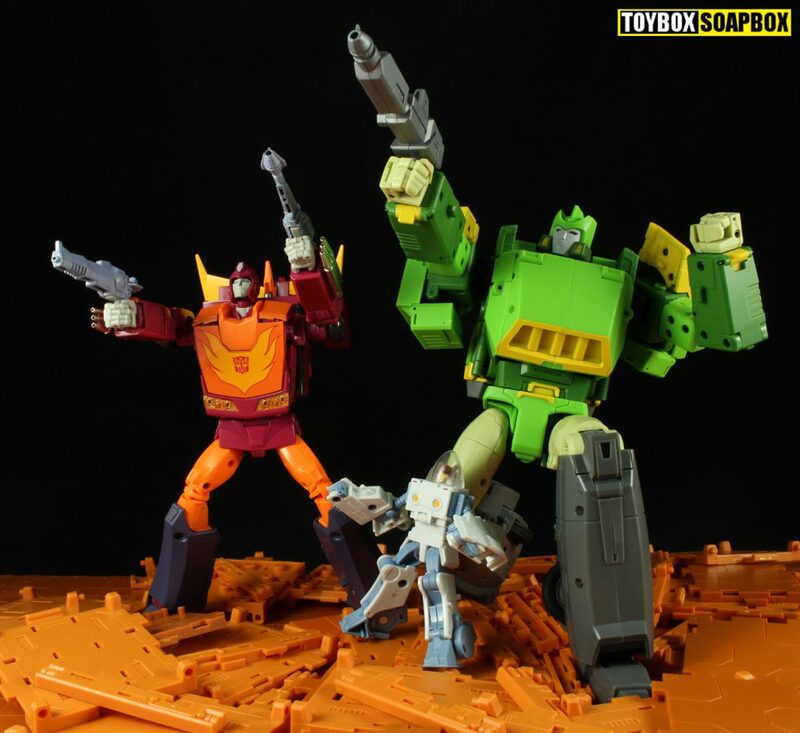 Open and Play are a company who take their name quite literally with the idea being you just open the box and transform the toy. An admirable ideal but if you are the sort who likes to follow instructions then you are as out of luck as Chris Waddle in the summer of 1990 – because no instructions are included. Open and Play are committed to their ideals, I get that, but the majority of their target market exist in a permanent state of paranoia about things breaking or paint scraping. So it might not go down so well. Still, you’ve always got YouTube, I mean we all secretly just watch reviews instead of unsealing the instructions now anyway don’t we….? Save the trees I say. Remarkably, for a triple changer, and one with such a straight forward transformation, you end up with a robot form that is pretty kibble free. The legs are the bottom of the alt modes and they conceal the tail of the helicopter which swivels to store within them. There is a green latch that you slide across to lock them in place – nothing has to snap. I approve. I hate toys that feel breakable by daring to move something (I am looking at you Fanstoys), so more of this sort of thing please. As you’d expect with the name Big Spring (get your mind out of the gutter), Big Springstein (copyright: Mr Strong) is a big bot. Scaled to fit into Masterpiece collections across the globe, his, heroic, well built frame towers over your MP cars but looks nice next to Ultra Magnus and MP 09 Rodimus in particular. 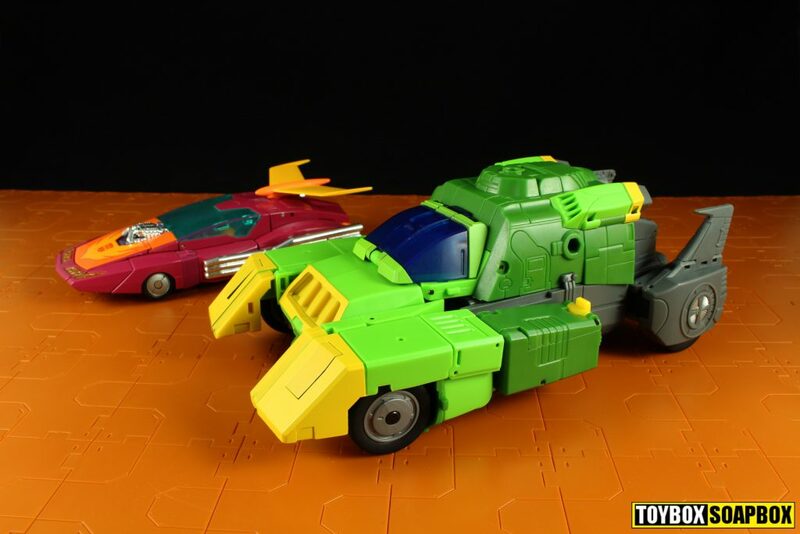 The cartoon could always fudge size so the difference between bots didn’t look so dramatic, but when you place this next to MP 28 Hot Rod it’s much starker. Not out of place but you just wonder how anyone could design doors on Cybertron with so many wildly different sized bots. The proportions on him are interesting. He’s got long, rounded legs and then a torso that looks like falling Tetris blocks. Buff git. Big Spring looks pretty on point but in trying to meld the animation with a big solid toy to be played with he can come across a little flat. There’s a bunch of detail but it can disappear into the flat, unpainted plastic, and the blank chest dominates so much of the visuals. At his size the problems with adhering to the animation model become apparent. 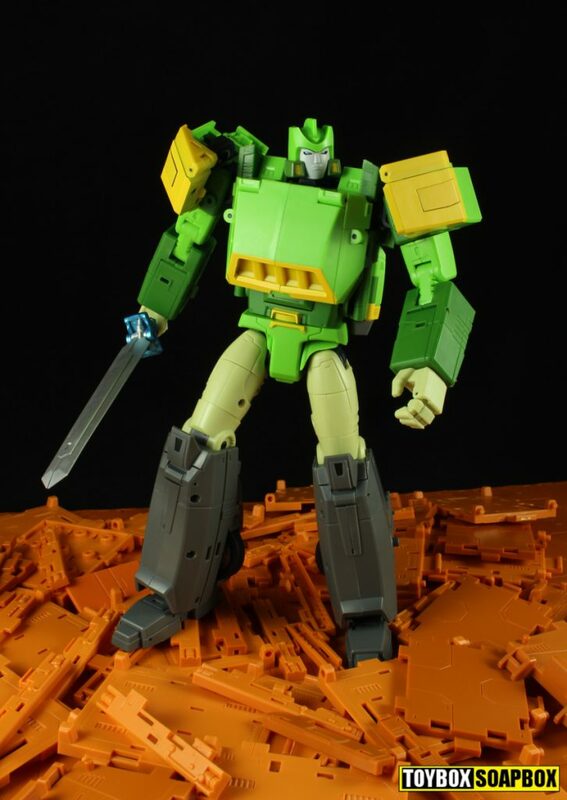 He’s a good looking bot, the colours are on point, all of the details are there but the amount of blank areas are more obvious due to the size. Something that doesn’t look good is that long face. Hopefully some enterprising individual can fashion a replacement that makes him look less like a squinting Jimmy Hill. As a toy that places play above everything else, the QC and articulation have to be top notch and for the most part they are. Each joint has a great range of motion, with the elbows even having a double hinge. Having a clean robot mode means nothing is restricted either. The shoulders, hips and elbows are on nice, loud, clunky ratchets and the tilting ankles are tight enough to keep Big Spring upright. It’s not all tickety boo, the clip that locks the chest to the torso is looser fails completely at it’s job. 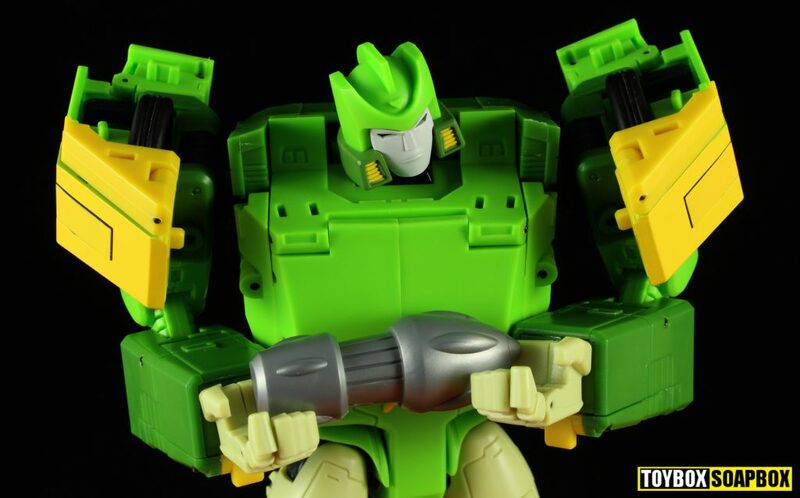 Exacerbating this are those clunky shoulder ratchets I mentioned earlier because now every time you move those arms the entire chest comes with them. There’s a decent sized cavity in there so you could always stuff a smaller bot in there and make him a Pretender for a bonus point. Some people will lament the lack of die cast but there is a lot of thick plastic that gives the figure a fair whack of heft. He doesn’t need metal…unless it’s NRG obvs. We’ve become accustomed to Masterpiece wannabe bots including character specific accessories. 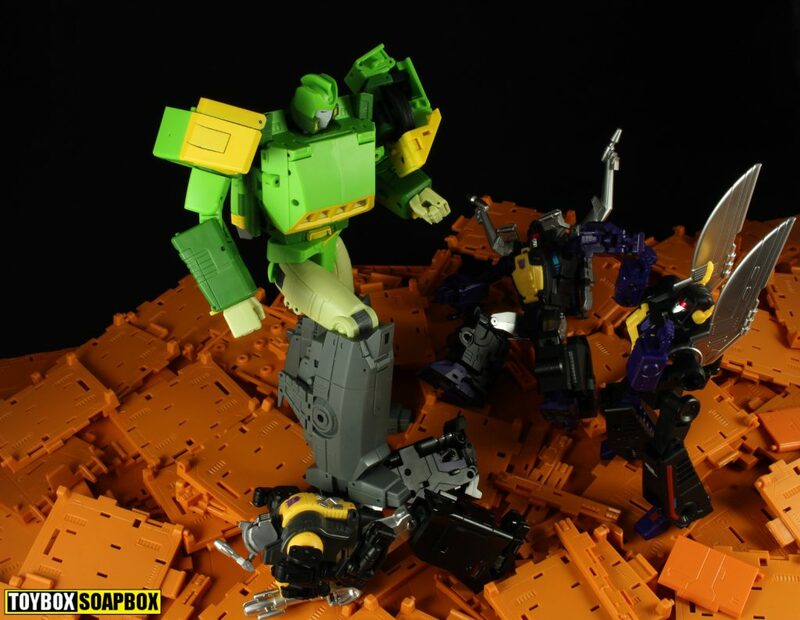 Big Spring gets one of the missiles he gazes at lovingly whilst reciting his signature “I’ve got better things to do tonight than die” line during the events of Transformers the movie. Could’ve done with some paint but that’s not Big Spring’s jam it seems. A rifle is also included, as you would expect and then you’ve got his sword that forms from the rotor blades. A clip is also provided to allow this to store on is back. Open and play have opted to skip the standard Masterpiece tab handles and have retained the standard 5mm pegs for everything. Each hand has a groove to hold them though the gun and sword tend to rattle around a bit. Not a lad with a firm grip. This is a toy that has a lot going for it and a few things that people may not get on with. It’s big, lots of fun, robust, easy to transform and designed to make you want to keep picking it up and playing with it. Open and Play have entered the market with a specific ideal and that is maintained in every facet from the toy itself to the omission of instructions. In your hands it’s a lovely thing to manipulate and pose, it’s also very rare to have a Masterpiece scale triple changer that is fun to transform. For a first attempt they’ve done so much right which is admirable. Running against it are the fact that it lacks the finish that people have come to expect from a Masterpiece style toy, the face is awful, car mode isn’t a looker and there are a lot of flat detail less pieces. A lot of collectors want a high end display piece over something trying it’s best to be an actual toy. Course, all of the above will be immaterial for plenty of people with the most appealing point being the price. 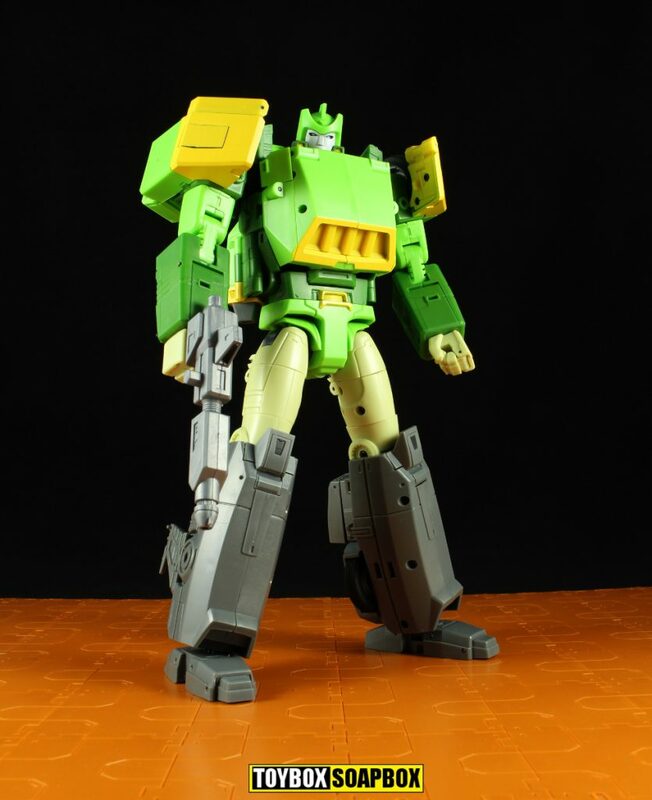 £60 for a large, Masterpiece style figure of this size is unheard of and will swing enough of the people looking to fill a Masterpiece sized Springer void. It is far from perfect but Springer isn’t a character I need a super expensive toy of, so for £60 I can deal with a couple of small caveats better than Ultra Magnus. Sorry the internet Gremlins ate your other post!